I'm on a mission to find a package-free, plastic-free, waste-free alternative to as many things as I can. I mentioned in my last post as part of the War On Waste Australia that I'm keeping a list of Things I Don't Buy Anymore, and cutting down on beauty products and toiletries is a big part of that. We're set for bulk, refillable foods now, but I've struggled to find somewhere I could fill my own jars with the ingredients to make the DIY beauty product recipes I've found. So I was excited to be invited to check out the new Naked Beauty Bar at Biome's Balmoral store in Brisbane. This is the first of their eco-friendly stores to include a dedicated refill station, along with recipes and pre-made, pre-filled jars. No plastic in sight either! Jars and jars of organic goodness! I packed my jute shopping bag with empty containers and ideas to make my own moisturiser, clay mask, beeswax lipbalm, reusable wraps and amp up my DIY deodorant game. I stocked up on shea butter, avocado oil, beeswax beads and bentonite clay to start with - and had so much fun doing it! I must say, my DIY body butter was quite the success. It's so fluffy and moisturising, and a little bit really does go a long way. I used a body butter recipe I found on Rawmazing, and just halved the amounts. Lauren from Trash is for Tossers also has a great recipe on her blog with a step-by-step video too. The ratio is half butter - I used shea butter - and half oil - I used a combo on coconut oil and avocado oil. Slowly melt shea butter and coconut oil in a bowl on top of a saucepan with simmering water (double boiler). Remove from the heat and let it cool for about 30 minutes or until cold enough to put in the freezer. Stir in the avocado oil and add essential oils if you wish. Place oil mixture in the freezer for about 20 minutes, or until partially solid again. Oils will solidify in the freezer again - this is a must! Once solidified (you should be able to press a finger in and make a dent) grab out your mixers and whip for about 10 minutes until you have a whipped cream consistency. The mix should stand up on the beaters. 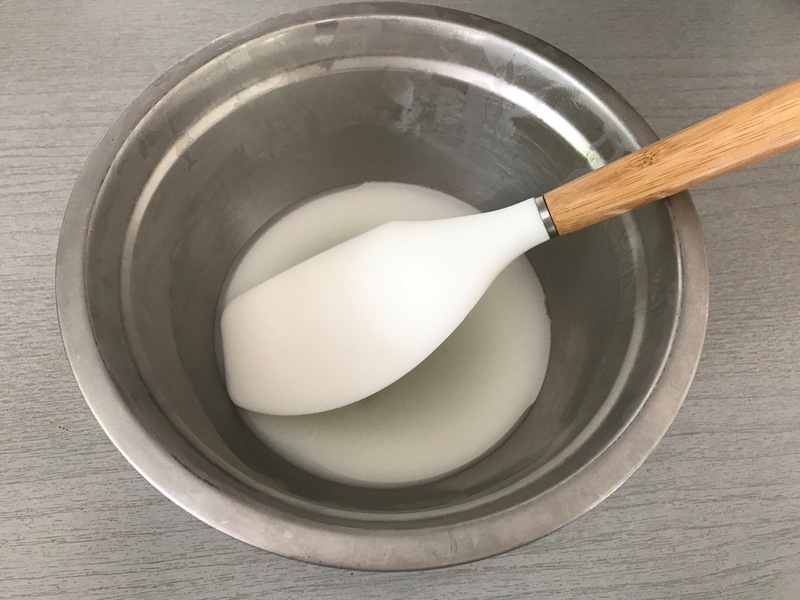 Use a spatula to lightly scoop your body butter into your storage container of choice - I chose to store mine in a metal tin with a lid, and a small glass jar for on-the-go! If you're having trouble getting it to whipped cream consistency, put it back in the freezer for a bit. I made the mistake of letting it melt a little too much again before I started beating. Another cold blast did the trick! A little bit really does go a long way with this one. I'll definitely be making it again! Have you had success with DIY beauty products? I can't wait to use my beeswax next time - stay tuned! And if you're not in Brisbane anytime soon, you can always find the ingredients in Biome's online store and purchase in adorable little reusable jars. While I was invited by Biome to try their Naked Beauty Bar, this post is an honest reflection of my experience - I'm a long-time fan of their approach to eco- and zero-waste living! Many of my previous blogs and social media posts feature items from their stores. "The future is naked" ... love that (in a wholesome, package free way).